even if you take account of Hofstadter's law. 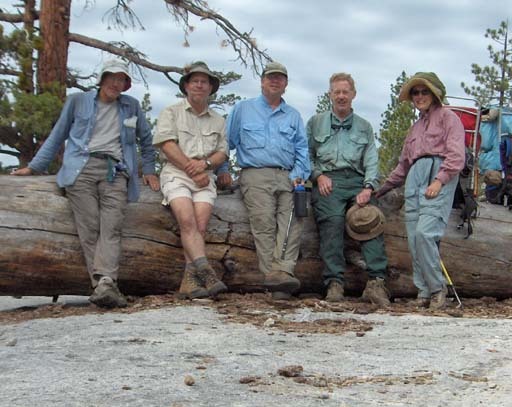 A group of five PFF'ers, Mike and Pat McGuire, Bob Schwer, Tony Plutynski, and Gary Trott found out way to the west end of Lake Edison on July 30th over possibly the worst paved road in California. The next morning found us on the ferry out to east end of the lake and the Mono Creek trailhead. 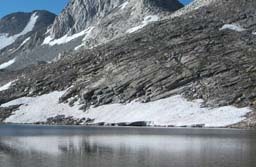 The overall plan was to go up Mono Creek to the Second Recess and go up through it over Gabbot Pass to Lake Italy. 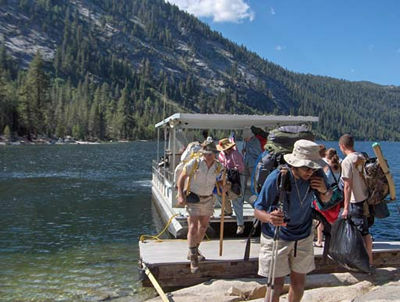 From there we would find our way through a series of the Bear Creek watershed lakes and follow Bear Creek down to the diversion dam exit. It didn't quite work out that way, but that was the plan. We got to the junction of Mono Creek and the Second Recess trail late in the afternoon and our first encounter with Hofstadter. It having been a wet year in the Sierra, Mono Creek was a raging torrent and it was unclear just how we were going to get across it. In the mean time fishing was also a bit tough. It's well populated with lots of fish, but getting a fly anywhere near one was a problem. 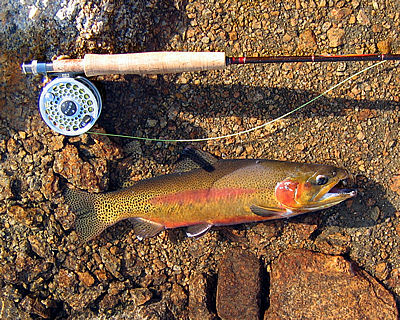 We all solved the problem in various ways and caught fish, but we had hoped for better. The next morning, there was the problem of the creek crossing. We found a possible spot, and Gary got across without a pack, demonstrating feasibility, and we made it happen, getting everyone across, but not necessarily dry. There is a reasonable trail part way up Second Recess and we made good progress until it petered out. We ended up on the wrong side of large dense patch of willows--our second encounter with Hofstadter. It took quite a bit of time and effort to get everyone extricated. The end of the day got us up to the Mills Creek lakes which had some pretty good fishing to offer for some lively goldens. The next morning, the objective was Gabbot Pass and Hofstadter got us again. A wrong turn put us up against a really loose and nasty moraine that all of us, especially Bob, would like to forget. Having gotten clear of this and some other difficulties, the approach to the pass resolved itself to a slog up a snowfield. But for all this wingeing there were many compensations. 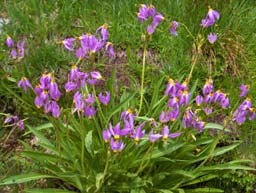 The wet year was very good for wildflowers. 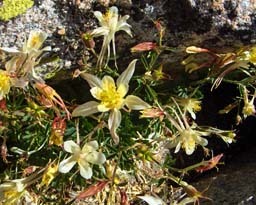 Memorable on this part of the trip were the shooting stars and the columbines. By early afternoon, we reached the pass, and before us was an easy descent to Lake Italy. Lake Italy was a disappointment for the fishing and another encounter with Hofstadter. The route we had planned would have required us to cross a steep snowfield where a slip would have deposited us pack and all in deep water. The high level of IQ of the group guaranteed that at least a couple of mutually exclusive contingency plans would be devised. However we sorted that out with while staying friends. The next morning, a short hike took us to lakes where the fishing was much better, and Gary staked his claim to top rod of the trip with the 16" golden he got. The following morning, we headed down the Hilgard branch of Bear Creek to it's junction with the main branch. Hofstadter nicked us one more time with another encounter with willows. 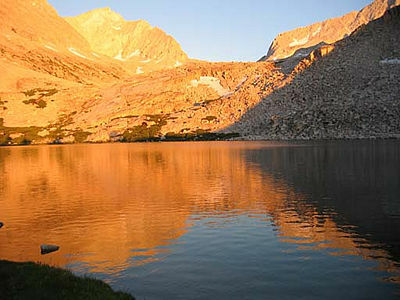 Tony's encyclopedic knowledge of the Sierra suggested a side trip to some lakes near the junction with the main branch. 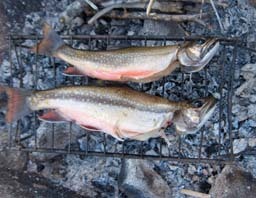 He and Gary made the effort to go up the Bear Twin Lakes which they found populated with suicidal brookies of nice keepable size. Most of them had to satisfied with a lip piercing, but a few were invited to dinner. The next day took us down to lower Bear Creek. 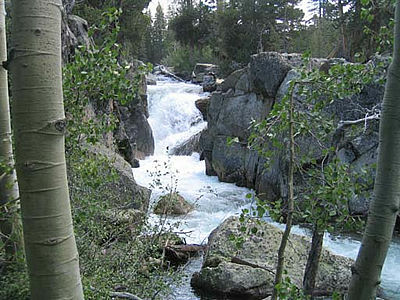 It's rather unusual for a Sierra stream in that it's a series of huge pools with very little riffle water in between. On first glance, it appeared to be frog water, but flies cast to likely spots brought up fish. 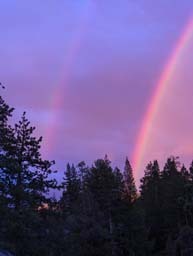 The day ended with a spectacular double rainbow at sunset, followed by a rainy night. A couple of hours walking the last day took us out to the diversion dam where we had left Gary's 4x4 before we started. We all celebrated with a shower and lunch at Mono Hot Springs.